Nothing is more relaxing than spending a day on one of Nashville’s lakes or rivers. Following is a list of Nashville’s best canoe rentals, river cruises, and places to float your boat in and around Nashville. Bring the binoculars, because wildlife abounds on the forested banks. Nature-lovers will thoroughly enjoy this! The Cumberland River Cruises out of Lebanon are another popular choice. 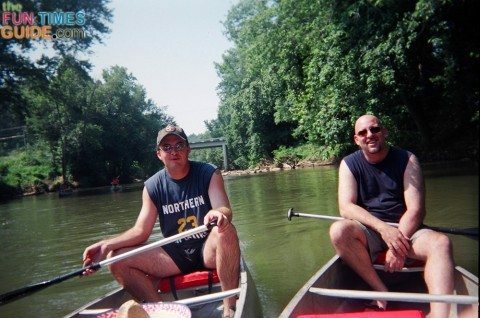 Here’s a sample itinerary for a canoe trip from Shelbyville/Tullahoma to Henry Horton State Park (60 miles in 3 days). Take a relaxing 45-minute Shoreliner Cruise, included with admission to Nashville Shores. Tackle the kayak obstacle course in Nashville Shore’s Kayak Cove. Introduce the kids to old-fashioned paddleboats while you’re there. Rent pontoon boats, jet skis, or banana boats for exploring Percy Priest Lake. Lake Acorn (17 acres) has a boat dock that is open through the summer. You can rent canoes, paddle boats, and jon boats in the summer. After Labor Day weekend, privately owned boats without outboard motors are allowed. Trolling motors are allowed. Lake Woodhaven (50 acres) has a year-round boat launch available to the public. Trolling motors are allowed as long as the boat does not have an outboard motor attached. There is no charge to use the boat launch. There you can enjoy one of the Montgomery Bell trails, take your own charcoal to one of Montgomery Bell’s picnic sites, or enjoy the Park Inn‘s buffet with breathtaking water views. It’s located just 15 minutes north of Nashville near Joelton. This 60-acre stocked lake is Nashville’s best kept water secret! Tours leave from Creekwood Marina on Sanders Ferry Road in Hendersonville, TN. The Vagabum RiverShip provides all of the amenities of a houseboat and all the luxury of your own private yacht. This 65-foot, all steel, any weather, ocean-experienced, mini-ship becomes your private party boat for up to 12 people. I highly recommend buying the local guidebook, Paddling Around Nashville. Author Patty Schultz researched every floatable river and creek in Middle Tennessee, noting launch points, take-outs and other essentials. She describes 37 different paddling trips in the area. Paddling Around Nashville makes an ideal gift for the paddling enthusiast. You can pick up a copy at REI in Brentwood or at local bookstores. Nashville Area Spraygrounds: FREE Water Parks!